I had no idea this was a book when I first saw the movie preview, but the preview stuck with me for a while. As soon as I saw that the book was up for review on NetGalley, I requested it immediately. The basics: R is a zombie who can't remember anything of his former life. He's bored with his undead "life" until everything changes on the day he meets Julie. Finally, R finds something worth living for. Yeah, I know what you're thinking. This can't be serious, right. That's what I thought too, but this book really got to me. It has everything: humor, romance, deeper meaning, violence and adventure. I love R's inner monologue, and he quickly became one of my favorite male narrators. "Sometimes I wonder if he has a philosophy. Maybe even a world view. I'd like to sit down with him and pick his brain, just a tiny bite somewhere in the frontal lobe to get a taste of his thoughts." "A fresh canvas is unfurling in front of us. What do we paint on it? What's the first hue to splash on this blank field of gray?" "We view ourselves the same way we view the Living: as meat. Nameless, faceless, disposable. But Julie's right. I have thoughts. I have some kind of a soul, shriveled and impotent as it may be. So maybe the others do, too. Maybe there's something there worth salvaging." I love the complexity of R's simple character. You can actually watch him evolve throughout the story. It's a great hero story, a great post-apocolyptic story, and most of all, a great love story. i read this at the beginning of last year. i made a joke about writing a zombie love story, and i was directed to this book. it was pretty good, but at times it was slow. 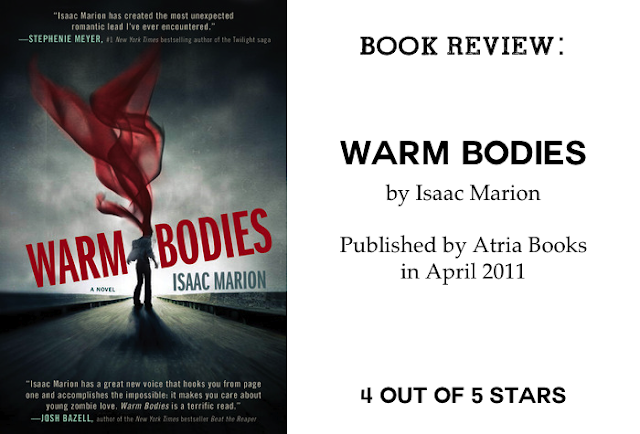 I really liked Warm Bodies because it was so different from other zombie stories (or love stories I guess) - glad you liked it too! I saw the preview for the movie and thought it seemed silly, but I have been reading so many great reviews of the book, I may need to check it out! I broke my "no movie before I read the book" rule this weekend but I'm okay with that because otherwise I would have missed a great movie. I have this on my Kindle an I think I'll bump it up on my list because of your review. Thanks!